Hanna Trace Elementary School Beta Club members pictured at the Ohio Junior Beta Convention. 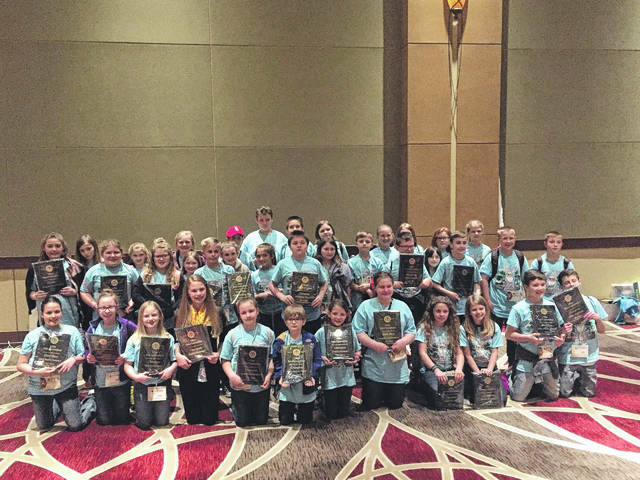 COLUMBUS — The Hannan Trace Beta Club attended the Ohio Jr. Beta Convention in Columbus on April 16 and came home with a number of awards. All 38 members attended. Students left Mercerville at six in the morning and returned at 10:30 p.m. that night. While in Columbus members competed against other fourth and fifth grade Beta members in various competitions. The final competition of the day was talent in which members performed and acted out the song, “More Than a Name on a Wall.” The song is about the Vietnam War memorial and the soldiers whose names are on it. Beta members held pictures of family members who had served in the military at one time. The group also displayed the boots of David Poling and his military picture. Beta club goers say individuals within the crowd were moved to tears with the performance. Individual and group projects placing first through third are now eligible to attend the national convention in Savannah, Ga. in June. Members will be doing fundraisers to help pay for the trip. Noah Day 1st place Woodworking, Reid Shafer 1st place Recycled Art, Kaylee Ruiz 3rd place Black & White Photography, Zoey Brumfield 1st place Jewelry, Molly McWhorter 1st place Fiber Arts, Regan Graves 1st place Black & White Pencil, Drawing Gracie Harrison 1st place Color Photography, 2nd place Wreath, Kennedy Shamblin 1st place Speech, Isabella Johnson 1st place Poetry, Emerika Eurell 1st place Language Arts Test, Savanna Spurlock 3rd place Language Arts Test. Alex Birchfield 1st place Math Test. Jacie Boothe 1st place Math Test, Blaise Davison 2nd place Science Test, Emma Clary 1st place Science Test, Hayden Green 3rd place Social Studies Test. Technology 1st place, Alex Birchfield, Noah Day, Ayden Conwell, James Sheets. Trading Pin, 3rd place, Reid Shafer. Talent, 1st place, all members. Songfest, 1st place, all members song written by Halli Angel. Scrapbook, 1st place, made by Jacie Boothe, MichaelAnne Ours, painted by Regan Graves. T-shirt, 1st place, designed by Savanna Spurlock, Fayth Stonecipher. Living Literature, 1st place, Jacie Boothe, MichaelAnne Ours, Jamie Writesel, Gracie Birchfield, Gracyn Null, Isabella Johnson, Emma Clary, Madison Summers, Emma Sanders, Fayth Stonecipher. Tower of Power, 3rd place, Jacob Smith, Ayden Conwell, Alexis Caldwell, Judah Cremeens. Book Battle, 3rd place, Emma Sanders, Halli Angel, Madison Summers. Robotics, 1st place, Gavin Smith, Hunter Wright, Bayleigh Waterhouse. Quiz Bowl, 3rd place, Gracie Harrison, Reid Shafer, Hunter Wright, Molly McWhorter.